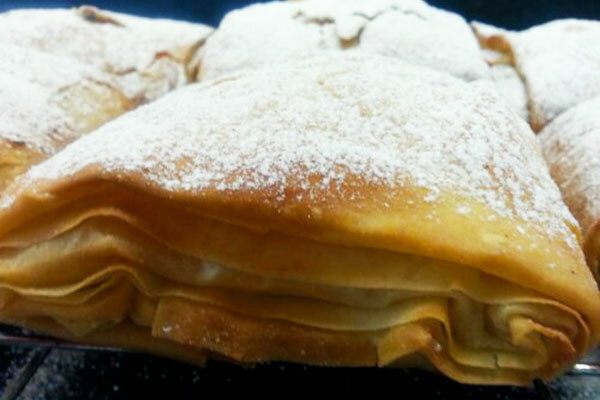 Traditionally eaten at Breakfast in Greece, this deliciously, sweet dessert is filled with a divine vanilla and semolina custard cream and encased in buttery filo pastry. Not for the faint hearted but oh so good with a cup of tea or coffee! Combine sugar and milk in a medium saucepan and stir over a low heat. Simmer to dissolve the sugar. Stir constantly, adding the semolina and salt. Keep stirring for 3 minutes to thicken. Add the 1 tbsp butter, vanilla extract and rose syrup if using. Transfer to a clean bowl, cover the top with clingfilm so a skin doesn’t form and set aside to cool. Preheat oven to Gas mark 7/200*C.
Melt remaining butter and get a pastry brush ready to assemble your parcels. Lay out a sheet of filo one at a time, brush with butter then place another sheet on top. Brush again with butter then place about a tbsp of the semolina filling in the middle. Now fold over each long end over the cream to overlap. Brush with more butter. Then fold over one end and roll up so you have a parcel. Place on a baking sheet covered with baking parchment seam side down. Make the rest then brush them all on top with more butter. Bake in the oven till golden and crisp for about 15 minutes. Allow to cool for 10 minutes then dust with the cinnamon icing sugar!